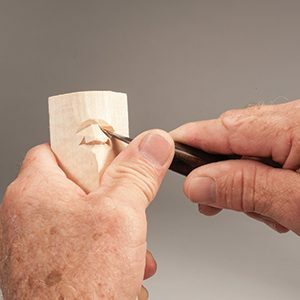 The nose is the most prominent feature of the face, and there are many different ways to carve one. You can increase the length, reduce the width, or change the shapes of the tip and wings. Try your hand at this large, bulbous nose, which is great for caricatures and demonstrates the basics of carving a nose. 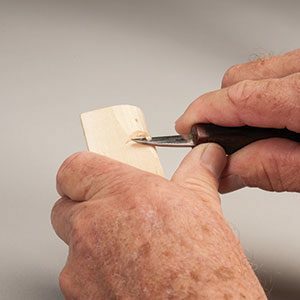 Master carver Harold Enlow shows you how to carve these tricky features. 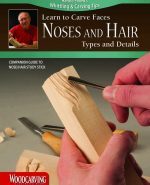 Learn techniques to carve noses and hair and create a face that speaks volumes. 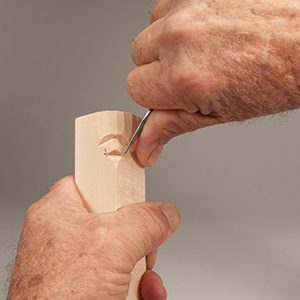 Harold Enlow was the first Woodcarving Illustrated Woodcarver of the Year in 2001 and is considered one of the grandfathers of caricature carving in the United States. 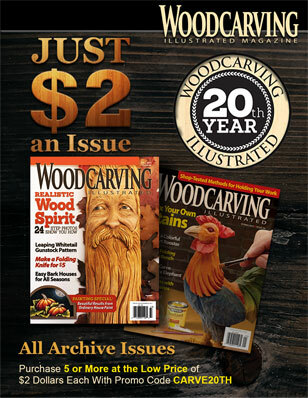 Harold, one of the founding members of the Caricature Carvers of America, is now an emeritus member. Step 1: Prepare the blank. Because the nose sticks out the most from the face, use the corner of the blank as the centerline of the nose. Round the forehead area and make a stop cut along the eye line with a carving knife. Cut up to the stop cut to rough in the eye sockets and the saddle of the nose (the thinnest part of the nose between the eyes). Deepen the eye sockets near the nose to separate the eyes from the bridge of the nose. Step 2: Widen the saddle of the nose. Because this will be a wide nose, you need to increase the overall thickness of the nose. Otherwise, the eyes will be disproportionate to the nose. 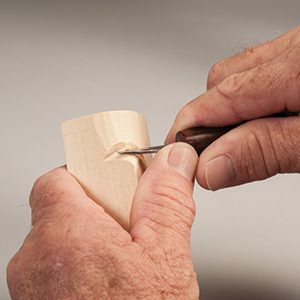 Make a stop cut down from the brow and use the knife to carve the saddle a bit deeper to make it flatter and wider. Step 3: Rough out the bottom of the nose. 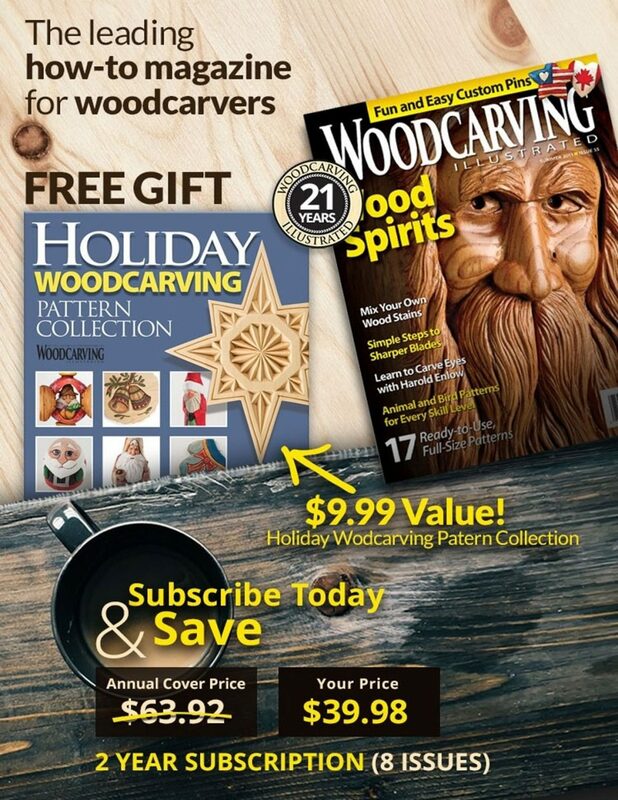 Make a stop cut along the bottom of the nose with a carving knife. Cut up to the stop cut to remove a wedge of wood from under the nose. This separates the tip of the nose from the rest of the face. Step 4: Outline the edges of the nose. Stop-cut along the side of the nose, and cut up to the stop cut to separate the nose from the cheeks. Half of the nose sticks out from the face and the other half of the nose is in the plane of the face. This roughs in the wide, squished nose. Step 5: Define the outer corners of the nose. 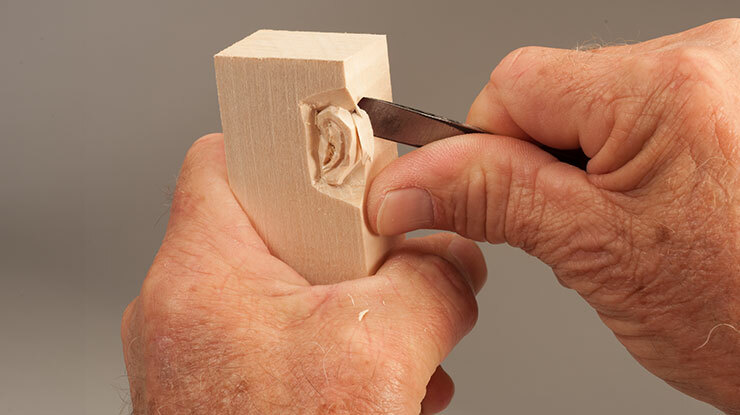 Use a 3/16″ (5mm) skew chisel and a carving knife. Stop-cut along the outer corners of the nose. Then, cut up to the stop cuts to set the nose back into the plane of the face. Step 6: Refine the cheeks and side of the nose. Carve alongside the nose up into the eye sockets. Because I am right-handed, I use a knife on the right side of the face and a 3/8″ (10mm) #3 gouge on the left side of the face. 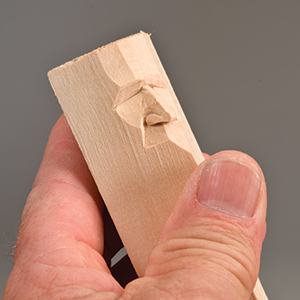 This helps me carve the face symmetrically without flipping the blank upside down. Start with the right side of the nose if you are right-handed and the left side of the nose if you are left-handed. 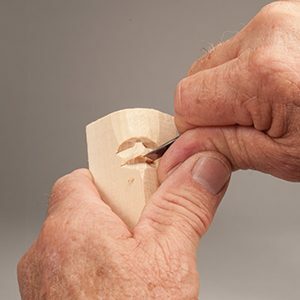 Deepen the eye sockets with a skew chisel. Step 7: Refine the shape of the nose. 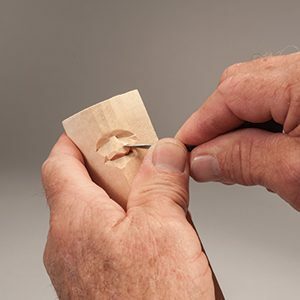 Use a 3/16″ (5mm) skew chisel to round and shape the sides of the nose. Step 8: Refine the bottom of the nose. 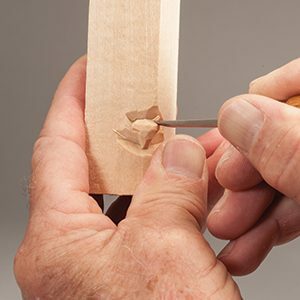 Using a 3/16″ (5mm) skew chisel, round and shape the bottom of the nose. Make a stop cut at the bottom corner of the nose, and cut up to it to roughly shape the bottom of the wings of the nose. This also roughs in the smile lines. Step 9: Finish the nose. 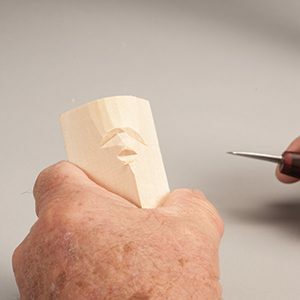 Carve the nostrils, holding the blank upside down. Stab in with a 1/8″ (3mm) #5 gouge on both sides of the septum (the flap of skin between the nostrils). Cut up to the stop cuts with a detail knife to free the chips. Remove any fuzzies with a denture brush. 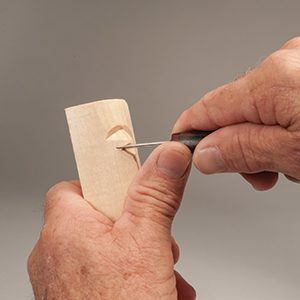 Carve a few wrinkles onto the top of the nose with a detail knife.